Tampa Bay evens the series at one game apiece, as Yanni Gourde and Tyler Johnson are instrumental in the win. 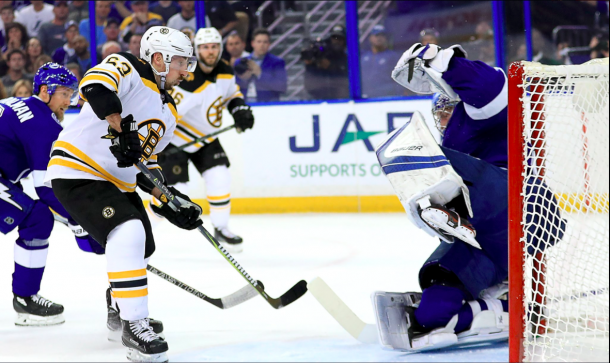 After completely botching Game 1 against the Boston Bruins, the Tampa Bay Lightning hoped that Game 2 could bring a better result, and hopefully tie the series before shifting to Boston. Tampa Bay came out swinging after getting a good shot off within seconds of the game starting. Tuukka Rask was there to make the stop on Tyler Johnson, but the pressure continued as Tampa Bay kept the puck in their offensive zone. The Lightning outshot the B's 9-0 within the first 10 minutes of the game. And with 8:13 remaining in the opening period, Yanni Gourde made one of the many shots count as he was able to slide the puck up and over the arm and leg of Rask to give the home team a 1-0 lead. With that goal, Gourde gave the Bolts their first lead of the series. It only took Boston 14 minutes (yes, only) in order for them to get their first shot on goal, but netminder Andrei Vasilevskiy was there to make the stop. The B's were granted a golden opportunity with more than five minutes remaining in the first after Johnson was sent to the box for roughing. Then, seconds later, Ryan McDonagh also was given a penalty for boarding. Boston came close to getting the equalizer but the shot from David Pastrnak hit the post and the back of Vasilevskiy but managed to stay out of the net. Tampa killed off both penalties and kept the momentum high. Charlie McAvoy finally got the Bruins on the board with his shot that slid past Vasilevskiy with a little more than one minute remaining. That goal got the benches going as the ensuing faceoff featured multiple players from both teams chirping at each other from their respective benches. A rather boring second period then turned into extreme excitement after Johnson was able to shoot the puck into the back of the net after Rask came far out of his crease, opening up half of the net for the puck to find its way giving Tampa a 2-1 lead in the second period. With that goal, Johnson has now scored 24 career playoff goals, which makes him tied for third with Vincent Lecavalier on the Tampa Bay Lightning all-time list. Rask got something he didn't get in Game 1: a whistle for an equipment issue. After losing his skate blade in Game 1 which then resulted in a Mikhail Sergachev goal, no whistle was blown and the goal counted. In this game, Rask lost his helmet which resulted in the officials blowing the whistle. If you were hoping for a physical, emotions running high game, this was the game for you. Scrums broke out everywhere, and you could tell that the game was getting pretty intense. Offsetting penalties at times, and just the look on the player's faces said it all. 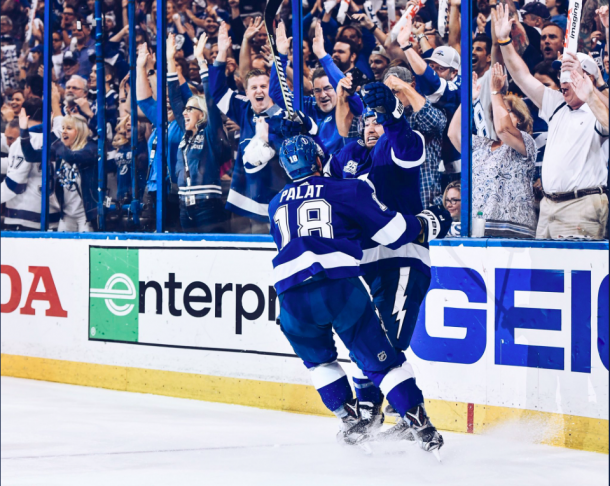 Ondrej Palat doubled the lead for the Bolts when Brad Marchand caused a turnover in his defensive zone and Palat fired home a shot past Rask to make it 3-1. Just minutes later, Torey Krug pulled Boston within one with his shot from a tight angle that squeezed past Vasilevskiy and made the score 3-2. Brayden Point sealed the deal with an empty-net goal with 25 seconds remaining. 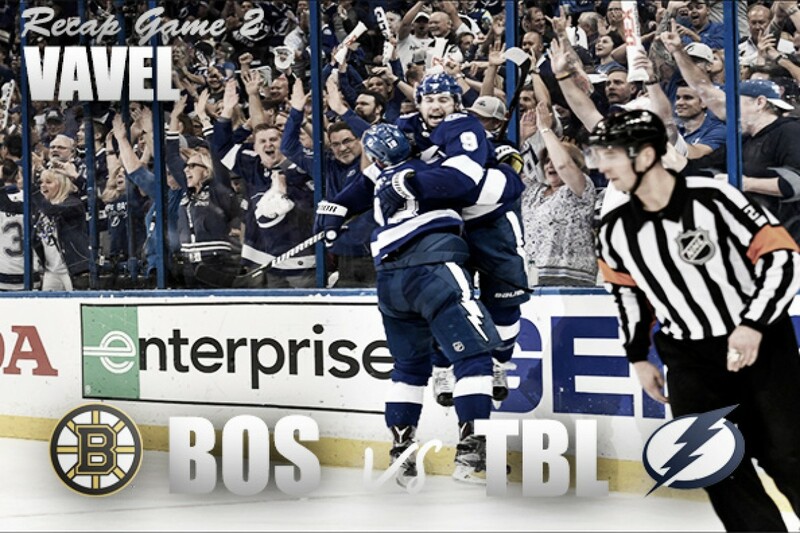 The Lightning went on to win the game 4-2 and leveled the series at 1-1 as they now shift to Boston for Games 3 and 4. Now that the series is even at 1-1, which team has the advantage in a pivotal Game 3? Let us know in the comments section below.